Robert Pattinson News: Breaking Dawn Part 2 DVD & Blu-Ray: Details Revealed! Breaking Dawn Part 2 DVD & Blu-Ray: Details Revealed! If you're still on a high from hearing there will be a Breaking Dawn Part 1 extended version, we have something else to look forward to: Summit today confirmed that the Part 2 DVD/Blu-ray are coming out on the same day! (March 2nd for U.S. - UK date is March 11th). The offical press release (via Yahoo) outlines all the details, including the special features it comes with. And check out this exclusive pic shared by EW. LOS ANGELES (January 14, 2013) - The Twilight Saga: Breaking Dawn – Part 2, the final chapter of The Twilight Saga, will be released on Blu-ray Disc (plus Digital Copy and Ultraviolet), 2-disc DVD (plus Digital Copy and Ultraviolet), Video On Demand and Digital Download on Saturday, March 2, 2013 from Summit Entertainment, a LIONSGATE company. Both the Blu-ray Disc and 2-disc DVD will feature hours of extensive bonus materials. The weekend street date allows for midnight events at retailers nationwide where eager fans will be lining up in anticipation of the finale's home entertainment release. With the release of Breaking Dawn - Part 2, which has taken in an incredible $290 million in domestic box office so far, The Twilight Saga will become the top-selling home entertainment franchise since 2009, having already sold over 50 million DVD and Blu-ray copies to date. Driven by an unbelievably enthusiastic and loyal fan base, Stephenie Meyer's Twilight series has sold over 116 million copies worldwide while the global box office for the complete film series stands at over $3.3 billion, with Part 2 achieving the highest grosses of all with $821.8 million. In addition, the franchise now has eight separate Facebook pages dedicated to its stories and characters totaling nearly 80 million fans. The Blu-ray and 2-disc DVD will include hours of bonus materials that are sure to satisfy even the most dedicated fans. A seven-part making-of documentary will provide an incredibly detailed behind-the-scenes look at how the finale of this epic series came together, including Bella's transformation, a global cast of vampires and the shocking climactic battle scene. The significant challenges of shooting Breaking Dawn – Part 1 and Part 2 back to back are exposed in the feature, "Two Movies at Once." 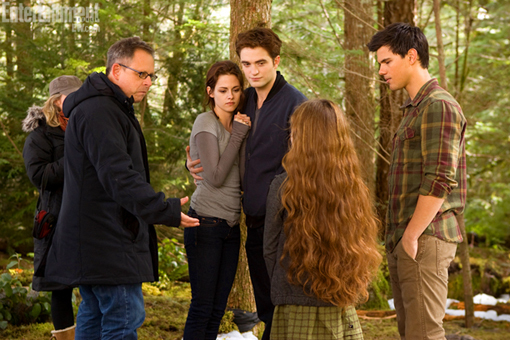 Viewers will also be able to gain new insight into the making of the film with an audio commentary by director Bill Condon. "Jump to" features allow fans to watch only their favorite scenes in the film featuring Edward Cullen and Jacob Black. The Twilight Saga: Breaking Dawn – Part 2 arrives on Blu-ray Disc and 2-disc DVD for the suggested retail price of $39.99 and $30.98, respectively. The Twilight Saga: Breaking Dawn – Part 1 Extended Edition will also be available on March 2nd. Both releases will be available for pre-order on January 14th, 2013. "The excitement of the worldwide sensation Twilight Saga's final chapter culminates with a massive home entertainment release that will reach fans and retailers nationwide," said Ron Schwartz, Lionsgate Executive Vice President & General Manager, Home Entertainment. "The Twilight Saga has changed the way studios and audiences look at the blockbuster, even altering how Hollywood rolls out its films. Making the home entertainment release as much of an event as the theatrical release, gives our passionate fans an opportunity to celebrate this much-beloved film all over again." In The Twilight Saga: Breaking Dawn – Part 2, the birth of Bella (Kristen Stewart) and Edward's (Robert Pattinson) child brings conflict between Bella and her lifelong friend, Jacob (Taylor Lautner), and an all-out war between the Cullens and the Volturi. Title Copyright: © 2012 Summit Entertainment, LLC. All Rights Reserved. Target, Walmart, and Barnes and Noble, will be offering their versions. Target claims theirs will have exclusive content. Click on the links to read all about them.